This was my first attempt at baking a ham. I used to have baked ham during the holidays growing up but never tried making it myself until now. I've been getting some of my meats lately from US Wellness Meats. They aren't "certified" organic due to the costs of getting certified in Missouri but they do use organic principles so they are considered organic. The animals feed on grass and not grain so the meat is very good for you. You can find out more about their farming here. They have tons of different meats from bacon to rabbit. I saw sugar free, uncured smoked ham on the site the last time I made an order and decided it was about time I give it a try. 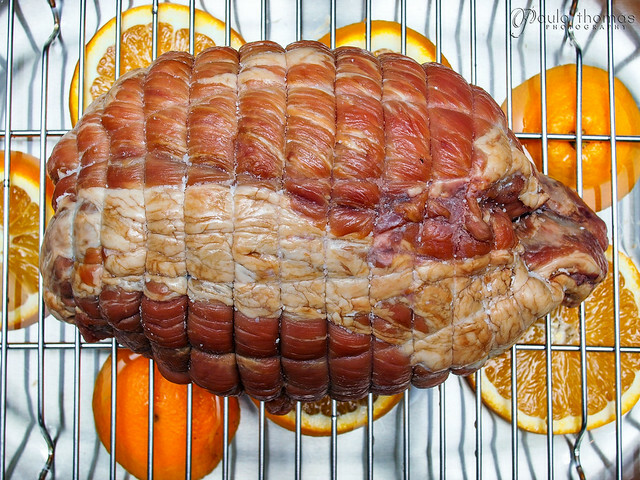 There's a ton of different types of ham: cured and uncured, wet cured and dry cured, uncooked and pre-cooked. I'm sure there's more but those are just a few. Since I got an uncured smoked ham I wanted to make sure I cooked it the right way because different types require different amounts of cooking. 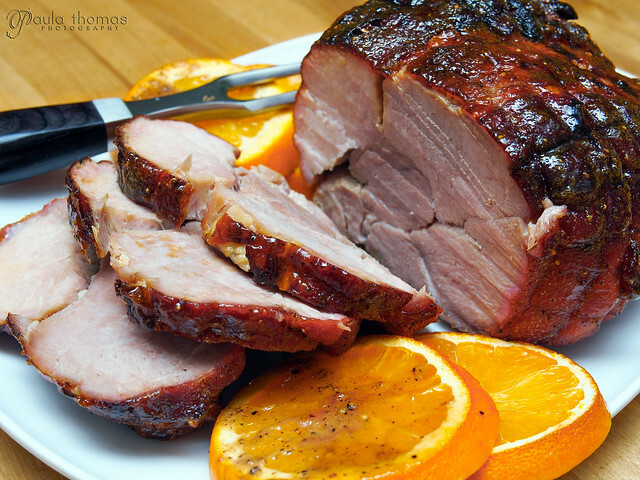 I ended up going with this Honey and Citrus Glazed Ham recipe I found on The Domestic Man blog. It sounded good so I went with it. Using this recipe, the cooking time comes out to 1 hour, or so it says. Since the recipe actually used a US Wellness Ham I figured it had to work right? 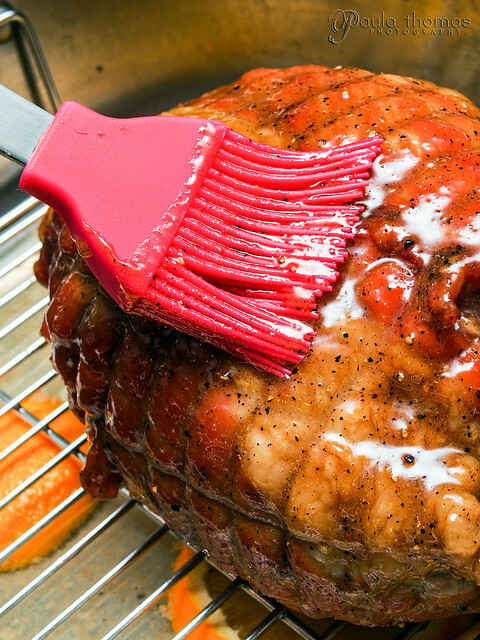 The temp of the ham was supposed to be 145 degrees after that amount of cooking. When I checked the temp it was like 60 degrees, far from being done. I had to roast it another hour and a half or so before it reached the temp it was supposed to be. I'm not sure where I went wrong, I double checked the oven temp and I let the ham rest for a half hour before cooking it to allow it to come to room temperature. I saw other recipes that say to let it sit at room temperature for longer periods. Anyway it ended up being really dry probably from roasting in the oven for so long uncovered. I won't be using that recipe again, at least not without some modifications. If I make it again I would let it sit at room temperature for an hour instead of 30 minutes and roast it covered for at least 1 - 1.5 hours, not 30 mins. I ate a few slices for dinner and put the rest in the freezer. I think what I'll do is use my new food slicer that I got for Christmas to cut it real thin and maybe chop it up and put it in some breakfast dishes like omelettes and breakfast muffins. I cooked it covered for 30 minutes but should have cooked it longer covered. I may have misread the recipe but thought it was supposed to come to 145 degrees after the first 30 mins. I think the extra hour and a half I roasted it was all uncovered. I would definitely like to try it again.